Eighty-three year old James Mullen of Endwell is proof that age is just a number. He is an accomplished artist who the Greater Binghamton area is proud to call one of our own. 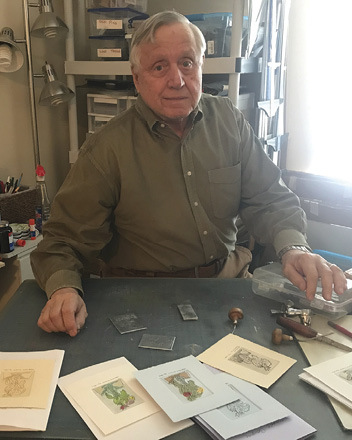 James knew that art would be his career at age 10 when he created his first cartoon and according to Jim he “just went on from there.” He has a BA and MA both in Art from Penn State and has studied additionally at various schools. Amongst his accomplishments he has received the Chancellor’s Award for Excellence in Teaching, taught studio and art history at SUNY Oneonta for 36 years, was Department Chair and he served as Dean of Humanities and Fine Arts. In addition, he also served for many years as Director of the Fine Arts Gallery and in 2008 the Gallery was given his name along with that of another colleague – the Martin-Mullen Fine Arts Gallery. 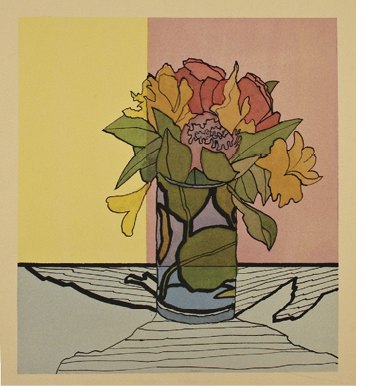 He has exhibited widely in regional, national and international juried art exhibitions and his work is in a number of public collections as a result of Awards from these juried exhibitions. And as if that is not enough, James says he “aspires to get better by doing”. James said after the death of his first wife to cancer and the empty nest from his two grown children starting out with their own lives, “Good Shepherd Village and Binghamton have become a fine and loving home for me. I’ve been active on the Board of the Broome County Arts Council; visits to the Print Class at BU, exhibitions, etc. 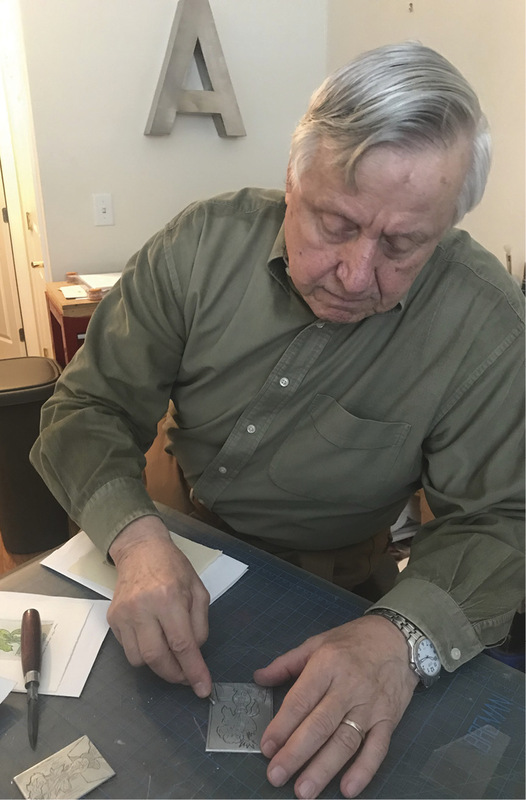 and very active with Windsor Whip Works Art Center.” James said two words to describe him would be “Artistic and Active because I continue to create art on a daily basis and send this art to highly competitive exhibitions, I make art and visit museums, and give art talks. Next November I will have an exhibition of my original Christmas cards and cards I’ve collected by other artists since 1955. I’ve created cards since 1955 and a good selection is in the collection of the Smithsonian Archives of American Art” (visit Archives of American Art Collections Yuletide Wishes). In James’ spare time he gives back to the Broome County Arts Council Service. He also gives his art to such places as the Butternut Gallery or the Good Shepherd Communities Foundation. And if not creating art he can always be found brightening the lives of his wife Teddy or his two children and two grandsons.